All Nursing Homes are not the same! This facility currently ranks within the top 10% of all Nursing Homes nationwide. SFFs have had serious quality issues. Recently Approved for Medicare This home was only approved for Medicare on 3/4/18. What is the Overall Star Rating? The Overall Star Rating represents the facility’s high-level performance across several areas. It combines the Health Inspection, Staffing, and Quality Star Ratings, each of which are presented in more detail below. The Overall Star Rating starts with the Health Inspection Star Rating, then adds or subtracts stars based on the Staffing and Quality Star Ratings. The chart to the right shows how the overall rating comes together. The Health Inspection rating, which CMS views as the most important, forms the basis for the rating. Facilities have the opportunity to earn "bonus stars" for high ratings in both Staffing and Quality, but they may also be assessed "penalty stars" for poor performance. Their rating can also be capped if they're a special focus facility, or "not rated" if they're too new, or are missing other ratings. For a complete guide to the Overall Star Rating Calculation, please see the CMS Documentation. Sorry! The Overall Rating Calculation is unavailable. *If the health inspection rating is one star, then the overall rating cannot be upgraded by more than one star based on the staffing and quality measure ratings. What is the Health Inspection Star Rating? The Health Inspection Star Rating is based on the past two annual health inspections at the facility. An independent state examiner inspects patient safety, physical hazards, cleanliness and regulatory compliance. For each shortcoming on the inspection, the facility is assessed a deficiency. Points are assigned based on the severity and spread of the deficiency. Fewer points are better. 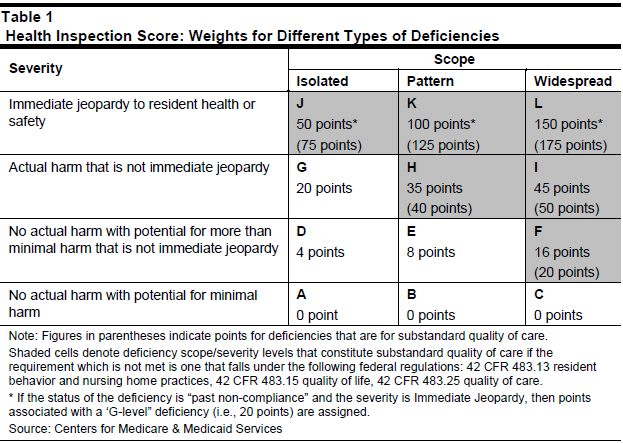 The chart below illustrates the different types of deficiencies, ordered by Spread/Scope (how many residents are affected) and Severity (how impactful the deficiency is). Use the arrow at right to see a summary of the most recent Health Inspections, and click on "Full Report" to see each deficiency. The total points from the past two inspections are combined and measured against state averages to determine the Star Rating for each facility. The chart to the right illustrates the point calculation. Each Inspection's total points are weighted (60% from the latest survey, 40% from the one before), then combined to create the Overall Weighted Points. This is then compared against a matrix for each state to determine the Star Rating. Health Inspection ratings are based on relative performance within a state due to variation deriving from many factors such as survey management, state licensure and Medicaid policy. Please see the CMS Documentation for more details. CMS is revamping how the Health Inspection Ratings are calculated, so ratings are frozen until Spring 2019. Read more here. Sorry! The Survey Rating Calculation is unavailable. What is the Staffing Star Rating? Having appropriate Nurse staffing is critical to maintaining the health and safety of the patients. Nursing hours are reported quarterly and summarized in two categories – RN (Registered Nurse) and Total Nursing. The average number of hours worked – per patient, per day – compared against a national average to determine the RN and Total Nursing Star Ratings. Every Facility is required to report their staffing levels from their payroll system every quarter. This data is aggregated and then adjusted based on the complexity of the residents in the facility. For full technical details, please see the CMS Documentation. These two Star Ratings are then combined to determine the Staffing Star Rating. The first slide at right shows how the RN and Total Nursing Star Ratings are determined, and the second slide shows how they're combined to arrive at the Overall Star Rating. Sorry! The Staffing Rating Calculation is unavailable. What is the Quality Star Rating? Patient health is at the top of the list for any Nursing Home. The Quality Star Rating uses 16 measures of resident health covering conditions like bed sores and key medications, and occurrences like falls and readmissions. The 7 Short Stay (e.g. Rehab) and 9 Long Stay Measures are reported quarterly. Each facility is given a number of points for its performance in each measure, and the total is compared against a national matrix to determine the Star Rating. The first slide at right shows the total quality points for this facility, and the second slide shows detail for each of the individual quality measures. For detailed information on the Quality Star Rating, please see the CMS Documentation. Sorry! The Quality Rating Calculation is unavailable. No Deficiencies reported. Great Job! DISCLAIMER: All data provided on this website is sourced from public information published by CMS.gov and is presented without any representation, guaranty, or warranty whatsoever regarding the accuracy, relevance, or completeness of the information. Any perceived recommendations provided on this site are provided for informational purposes only, and should not be construed as legal or operational advice.